With Manchester United among those supposedly interested in signing Philippe Coutinho from Barcelona this January, Liverpool risk missing out on a large chunk of the £142m fee agreed for the Brazilian. Coutinho signed for Barcelona in January 2018 after the Catalonian giants agreed an initial £105m transfer fee with Liverpool. However, various clauses included in the deal meant that the fee could rise to as much as £142m. Coutinho's move to Barcelona hasn't worked out as planned and the Brazilian has grown disenchanted with life in Spain. In light of this, The Mirror are reporting Manchester United's willingness to offer the former Liverpool man a way out. This would spell bad news for Liverpool as they risk missing out on a staggering £22m worth of add-ons. The first potentially unfulfilled clause would be an added £4.4m for every 25 games that Coutinho plays for Barcelona up to 100 games. Having made 34 appearances already, the Reds have received one out of four potential payments but should Coutinho leave in January Liverpool will miss out on £13.2m just with this clause. Added to this loss would be the clause which demands that Barça pay £4.4m should they qualify for the Champions League. However, Coutinho must be in the team come the end of the season for this bonus to apply. The same rule applies for Barcelona winning the Champions League. Liverpool would only receive the additional £4.4m if Coutinho remained until the end of the season. Therefore, not only would Manchester United add a world class player to their squad but they could spite their rivals along the way by signing Coutinho in January. Whilst Marca claim that Coutinho has 'hit rock bottom' at Barcelona, a deal with Manchester United remains a long way off. Barça would have to receive an offer close to or above the £105m they paid for the Brazilian. 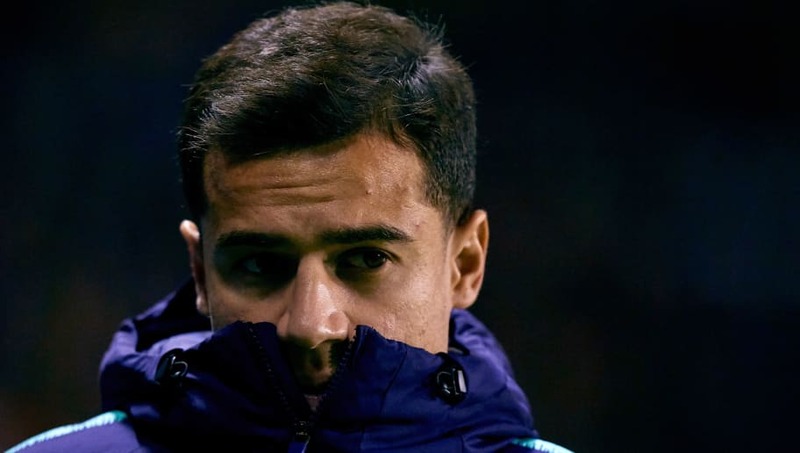 Additionally, Barcelona's manager Ernesto Valverdo has urged Coutinho to knuckle down and regain his spot in the starting 11 rather than quitting. This was once the Brazilian's dream move and it's hard to image that he'll give up on it so easily. Barcelona faced Eibar at home in La Liga on Sunday, and Valverde's side managed to reaffirm their five point lead at the top of the table after Atlético Madrid's 1-0 victory over Levante. Lionel Messi scored his 400th goal in the competition as Barca ran out 3-0 victors.